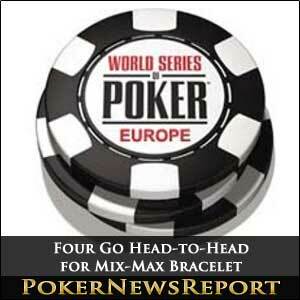 After three days of intense competition, just four players remain in the WSOPE Split Format NL Hold´em Championship. Roger Hairabedian and Michael Mizrachi have a substantial chip advantage over Noah Schwartz and Shawn Buchanan, but the two big guns have been drawn against each other in the first of two semi-finals today – meaning that whoever wins that fixture will take a million chip advantage into the final. The structure of the Mix-Max Championship has lead to the unique scenario whereby one player will enter the final heads-up match with an almost 2:1 advantage. The final sixteen players had carried their stacks through from both the full table leg of the tournament and the 6-Max leg before competing in the first of the heads-up rounds. Consequently, the chip leader after two days would have a considerable advantage over a lower ranked player when it came to two-handed play. That was certainly how it played out in the early rounds of the heads-up. The chip leader going into the final sixteen was Brian Powell, who easily overcame Matt Waxman for a place in the final eight. Roger Hairabedian also overcame the lesser-stacked Dmitry Motorov, although there was a reversal of fortunes for Eric Seidel and Kent Lundmark – both players having larger stacks than their opponents yet losing their first round matches to Brian Hastings and Michael Mizrachi respectively. The second half of the draw presented a great opportunity for Jason Mercier to play his way into the final, as all of the seven other players had smaller chip stacks entering the knockout phase. However, he was out-played by Shawn Buchanan and the shortest stacked player of all, Anatolii Ozhenilok, also caused an upset by beating Joel Nordkvist. The final two matches of the first round saw Dan Fleyschman overcome the closely matched Alexander Roumeliotis, and Noah Schwartz eliminated Bryn Kenney. The quarter finals of the WSOPE “Mix-Max” tournament also had their fair share of surprises. Roger Hairabedian was at a massive disadvantage against Brian Powell but kept his stack intact until fortunately doubling up against the chip leader and then taking control of the encounter. Michael Mizrachi always seemed to be in control and ground down Brian Hastings to be the first player through to the semi-finals, while Shawn Buchanan first lost his chip advantage and then regained it to knockout Anatolii Ozhenilok and Noah Schwartz played out a classic encounter with Dan Fleyschman to emerge triumphant despite going into the match at a 1:2 disadvantage.